Let's go to the Word of the Lord in Matthew 10:28 "Do not be afraid of those who kill the body but cannot kill the soul; but rather fear Him who is able to destroy both soul and body in hell"
Whenever a soul arrives in hell, that person acquires a body of death. The Lord Jesus took my hand and we began to go downwards through a very deep dark tunnel that led to the center of the Earth. We arrived at a place with several doors; one of them opened and we entered with the Lord. I would not let go of the Lord's hand, because I knew if I did, I would stay in hell forever. We went in front of one of the flames and it started to go down slowly. Soon I could see a person inside, and when he spoke, I could tell it was a man. The man was wearing a priest's garments, which were totally filthy and shredded. Worms were slithering inside and out, all over this man's body. He looked charred and burnt by the fire. His eyes were plucked out and his flesh was melting and falling to the ground. But after the flesh would all fall off, it would grow back, and the whole process would resume. When he saw Jesus he said, "Lord have mercy on me, have mercy on me! Please let me out of here just a moment! Just a minute!" On this man's chest was a metal plate that read, "I am here for robbery." When Jesus came close, He asked the man, "What is your name?" The man answered, "Andrew, my name is Andrew, Lord" The Lord asked him, "How long you have been here?" Andrew answered, "I have been here for a very long time." The man began to tell his story. He said he had the responsibility of collecting tithes and organizing monetary distribution to the poor in his Catholic church. However, he would steal the money instead. With eyes full of compassion, the Lord asked the man, "Andrew, have you ever heard the gospel?" Andrew replied, "Yes Lord, there was one Christian woman that went to the church and she preached the gospel once, but I didn't want to accept it. I didn't want to believe it, but I believe it now! Now I believe that this is real! Please Lord take me out of here, at least just one moment!" As he was speaking, worms were crawling through his eye sockets, exiting his ears, and coming inside again through his mouth. He tried to pull them off with his hands but it was impossible. He was shouting horribly and kept begging God for mercy. He kept asking Jesus to take him out of that place. Even worse, there were demons tormenting him, constantly piercing him with their spears. The demons looked just like one of the toy dolls that we have here on earth called "The Jordanos". I saw those dolls in hell, but they were not dolls anymore; they were alive and demonic. They were abut 3 feet tall and had very sharp teeth. Blood came out of their mouths and their eyes were completely red. As we continued, we saw thousands of people in torment. Whenever a soul saw the Lord, they tried to reach Him with their skinny hands. I noticed a woman that started to shout when she saw Jesus. She screamed, "Lord please have mercy on me! Take me out of this place!" She was suffering a lot and she extended her hands towards the Lord. She kept begging Him to take her out of that place at least just one second. She was totally naked and covered with mud. Her hair was all dirty and worms were slithering up and down her body. She tried to take them off with her hands, but every time she scraped some away they multiplied even more. The worms were about 6-8 inches long. The Word of the Lord says in Mark 9:44, "Where their worm never ceases and the fire is not put out"
It was so terrible seeing this woman and hearing her cries as the worms voraciously ate her flesh. There was a metal plate embedded in her chest that could not be destroyed by the flames. It read, "I am here for fornication." In the same manner of her sin, this woman was forced to fornicate in hell with a very disgusting and fat snake. The snake had huge thorns around its body, about 6-8 inches long. The snake penetrated her private parts and traveled up her body to her throat. When the snake entered her, she started to scream. She begged the Lord more intensely to take her out of that place, "Lord, I am here for fornication, I have been here for 7 years, since I died from AIDS. I had six lovers, and I am here for fornication." In hell she had to repeat her sin over and over. She had no rest day or night, suffering the same way all the time. She tried to extend her hands toward the Lord, but the Lord just told her, "Blanca, it is too late for you. Worms shall be your bed, and worms shall cover you." (Isaiah 14:11) When the Lord said those words, a blanket of fire covered her, and I could no longer see her. We continued walking, seeing thousands and thousands of people. There were young people, adults and elderly people suffering in torment. 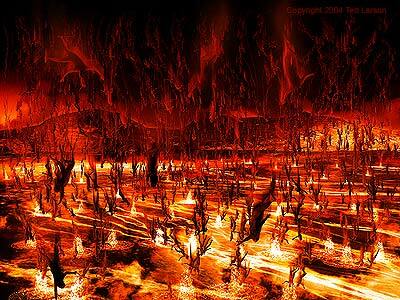 We arrived in a place that looked like a big swimming pool of fire, with thousands of men and women inside of it. Each of them had metal plate on their chest that read: "I am here for not giving tithes and offerings" When I read that, I asked the Lord, "Lord, how can this be possible, that people are here for this reason??" The Lord responded, "Yes, because these people thought that tithes and offerings were not important, when my Word shows it as a command." In Malachi 3:8-9 it says "Will a man rob God? Yet you are robbing Me. But you say, 'How have we robbed Thee?' In tithes and offerings. You are cursed with curse, for you are robbing Me, the whole nation of you." The Lord told me that when His people withhold their tithes, it hinders the work of the Lord, and then the Gospel is not preached. People in this place suffered a thousand times worse than others, because they knew the Word of the Lord and disobeyed. We continued walking and the Lord showed me a man. I could see from his waist to his head, and I started to have a vision of how he died. His name was Rogelio. He was in his car while a person got close to preach the gospel to him, and gave him a Bible. But Rogelio ignored that person's warning and continued on his way, without knowing that a few minutes later his car would crash. It fell into a precipice, and he soon died. The moment he crashed, the Bible opened to Revelation 21:8, "As for the cowardly, however, and the unbelieving, and the depraved, the murderers, the immoral, those practicing magic arts, and idolaters, and all liars- their lot is in the lake that burns with fire and sulfur. This is the second death." When Rogelio read this verse, he died and arrived in hell. He had only been there one month and still had some flesh on his face. However, he was suffering like everybody else. At first, he did not know why he was in Hell. I think when that Christian got close to his car, it was the only and last chance for him to accept the Lord Jesus. The same way that many have had the opportunity to accept Him. Today, I invite you to open your heart to Jesus; He alone is the way, the truth, the life. (John 14:6) Only through Him we can be saved into the Kingdom of Heaven. (Acts 4:12) The Lord also asks us to follow His ways in holiness and honor. d six people. These six people now surrounded him, and were shouting at him saying, "It is your fault that we are all in this place, YOUR FAULT!" The murderer tried to cover his ears because he didn't want to listen to them, but he could not avoid listening since in hell all your senses are much more sensitive. Souls in that place were tormented with an intolerable thirst for water that can not be satisfied in any way; like the Bible story of Lazarus and the rich man. (Luke 16:19) The rich man in Hell wanted only one single drop of water, that would have been enough. The Word of the Lord says in Isaiah 34:9, "The streams of Edom shall be turned into pitch and her soil into brimstone; her land shall become burning pitch." Then God took us to a place much worse than the other places that we had seen. We saw the lake of fire and brimstone. On one side of that lake there was a smaller lake. In that smaller lake, there were millions and millions and millions of souls crying and begging the Lord to have mercy on them. They said to Him, "Lord please! Take us out of here at least just a little moment! Please give me the chance to go out!!!" However, the Lord could not do anything for them because their judgment was already set. Among those millions and millions of people, the Lord allowed us to focus on one man whose body was half-way submerged in the lake of fire. The Lord let us understand and know his thoughts. The name of that man was Mark. We were amazed by the things this man said to himself, in his thoughts. We learned an eternal lesson when we heard the following thoughts, "I would give anything to be in your place now! I would give anything to go back to the earth just for one minute. I wouldn't care if I were the most miserable, most sick, most hated, or the poorest man in the world, I would give anything to go back! Just for one minute on the earth." The Lord Jesus was holding my hand. Jesus replied to Mark's thoughts saying, "Mark, why would you like to come back to the earth even for just one single minute?" With a crying and tormented voice, he told Jesus, "Lord! I would give anything to go back to the earth just for one single minute simply to repent and be saved." When the Lord heard what Mark had said, I saw blood come from Jesus' wounds and tears filled His eyes as He said, "Mark, it is too late for you! Worms are set for your bed and worms will cover you." (Isaiah 14:11) When the Lord said this to him, he sank in the lake forever. Sadly, all those souls have no more hope. Only we on Earth have the chance to repent today and go to Heaven with our Lord Jesus Christ.